HARRISON—Toll Brothers’ groundbreaking adaptive reuse of two office buildings here has a new partner and more than $100 million in construction financing. The developer reports it has formed a joint venture with New York City-based J.P. Morgan Asset Management to develop the $157 million, 421-unit Carraway luxury apartment property off Westchester Avenue in Harrison. The joint venture has secured a $102-million construction loan split evenly among Wells Fargo, National Association, which is serving as administrative agent, and Capital One. The debt and equity financing deals were arranged by Toll Brothers’ in-house finance department. 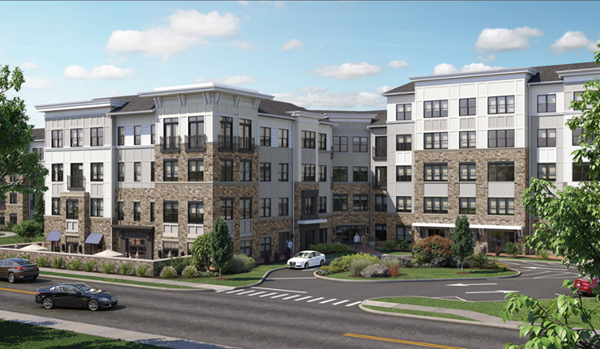 Toll Brothers Apartment Living will manage the development, marketing, leasing and property management of Carraway. The Horsham, PA-based development firm broke ground on the project in August 2017 that initially involved the demolition of the 103 Corporate Park Drive and 105 Corporate Park Drive office buildings. The 10.3-acre site is directly adjacent to the Westchester Lifetime Fitness Health Club (built at the site of the former Journal News newspaper) and the future site of grocer Wegmans’ Harrison store, which also will be built on the site of a former office building. Carraway, when completed will have ground floor retail and an in-building parking garage. Among the planned amenities include a club room, fitness center, kid’s playroom, pet spa, bike lounge, craft room, co-working lounge and pool. Leasing and first move-ins are projected for late 2019. The project involves the first conversion of an office building to residential use in the Town of Harrison and along the I-287 commercial corridor.